The agricultural community founded in 1376 occupied by German-speaking population has evolved in a similar manner as all agricultural villages in the region. Early 20th century it was a modest town, which had 491 houses and 3,576 inhabitants. Radical change in the development of the village was the year 1909, when the industrial production of coal started. Increased employment in the mine population, although initially they worked more on the surface than in the underground. Mine gave bread vast majority of the population, affecting the architecture of the city, building infrastructure, culture of people. Today,town with nearly 18 thousand people is the second largest town in the Upper Nitra, experiencing the development not only in building infrastructure, but also additional value-added town. In the 21 century, Handlová gets another chance by nature. In recent years, the citizens of the city became more experienced with the fact that the city and its surroundings there is a lively building activities. During the year 2009 the central belt has been completely restored at the Road of the 29th August , which is the gateway to the town from the south . It was changed all the public lighting along the city, which substantially affected the transport of a busy main road. Paths were built with a total length of 2 km, more than 100 parking spaces were built too. Principal change in the infrastructure of roads in the town is building road I/50 relocation center, called as a small bypass . This large investment is in the hands of the Slovak Road Administration and significantly will reduce traffic on the Miners Square. In this context, town Handlová announced the architectural competition before the end of 2009, and already there is a vision of how the downtown will be upgraded and modified. It will fulfil the modern requirements for building a rest area. At the last period the town think about the young people who have a requirement for their own housing. 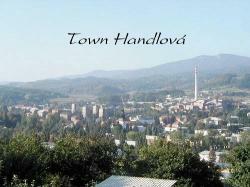 Today Handlova residents and visitors will find everything what they need in the town. Among the various grants, subsidies and EU funds in the town Handlová, two elementary schools of three has been reconstructed, sports facilities were built, playgrounds on housing estates were restored. There is a kindergarten with four elocated departments, private nursery school, two basic schools of art, three secondary schools and special primary schools. Rest and relax in the city has been long provided by a pool of town Handlová, which is going to pass a full reconstruction of the thermal distribution this year. The city was successful in administering the project from the Norwegian Financial Mechanism and the reconstruction which began at this time, significantly will increase the quality of provided services. Re-opening is scheduled for September 2010. The town police looks after the security in the town almost twenty years . The newly-built camera system monitores the selected locations 24 hours a day. The system expands each year, which greatly contributes to the clarification of the offense and the protection of property of the city and its inhabitants. Since 2006, the town launched a separate collection of sorted waste. The town maintaines a partnership with the cities in the Czech republic, Poland, Hungary and Germany for many years , to develop and cooperate in a number of fields. The Humanities Center, The Home for lone parents, three homes with nanny care are beyond the town scope. Field social workers have been providing services for families with social exclusion for six years. For cities that begin with these activities, Handlová is example of good practice. A clothing bank has been successfully set up in this domain, attendance of children to schools and care for their health was improved, a "halfway house" was realized and projects for the prevention of trafficking and drug use were prepared too. The town provides non-recurring childbirth benefit and benefit for people living in poverty. Pensioners can use daily Center (formerly Club of retired people), which provides an active life of the elderly population throughout the year. Intention of the town is to use a former elementary school and establish a Senior Center here,so the town has already brought the project . This step will ensure a complete social network in the town Handlová. In 2010 town introduces social service taxi and transportation services. The town has set up business incubators for start-up businessmen , which has entered to the fourth year of its existence in 2010 . This year new service is preparing - Virtual Business House, whose aim is to encourage businessmen in the town. Falling-off mining, led to lower employment of population, which reaches the level of 14.5% now. The current situation in the area of the town is addressed through the activities of the Programme for training of unemployed people, for which the town received EU funding. If you walk through the whole valley of the mountain range Vtáčnik in that time, where Handlová stretches for more than 8,5 thousand hectares, the greenery welcomes you from the north and from the south . The options for hiking around the town was extended by building of The Tourist mining educational path. It was handed over to the public from the initiative of the town and Mining Association in Handlová in 2009, it is 9.5 km long trail, where you can visit the 13 stands with the information boards about nature and life in Handlová. The research was carried out of Handlová hole basin, which can open the further options of tourism development in and around the town. The mineralized water with temperature of 37.5 ° C was discovered in the depths of 1201 metres. There will also find many historical monuments, the famous church of Saint Catherine in the center of the town. In 2009 the building of the Mining Museum began, as a separate exposure of the Slovak Mining Museum in Banská Štiavnica. Brown exposure will get to Handlová, where coal mining began one hundred years ago. Mine was not only asset for the town. Last year a tragic event of 10 August, which killed 20 miners and mine rescues at their work, do not let us forget. Memorial for victims of mining accidents in the town cemetery, which was created by a local national artist in 2008, became regional in nature and intention of the town is to become the Slovak cultural heritage. Today, 466 names are carved on it. People from Handlova do not forget. On 10th August 2010 memory of miners will be held. It organizes three city fairs. The first is the May Urban fair. In September you can meet with your friends at the Mining Fair, which has lasted more than 50 years. and The Catherine Fair is at the end of the year. Town regularly organizes many events for the whole family, for example „The way through the fairy forest“ for more than 35 years in June . You can visit the interesting extra league games in basketball for men, thanks to fans and sponsors the town football team will return to restore . You can meet celebrities in Handlová at the concerts as Country Market, On the shore, and so on. The House of Culture organizes a number of events and you can visit the cinema with the news. „CVČ Relax“ is created for leisure time of children and youth, with a number of interesting clubs. There is the seat of Children and Youth Parliament of Handlová town, as an advisory body of Mayor for youth. You can find all about upcoming activities and projects of the city,when you visit www.handlova.sk. Come, we are open all year round!